From our retail shop in Belleek, Co. Gilmartin's The Craft Shop. Includes Stable, Mary, Joseph, Jesus and Crib, Star, Donkey, Shepard and Sheep. Measures 36cmH x 35cmH in total. Packed in a sturdy box for safely storing away year after year. 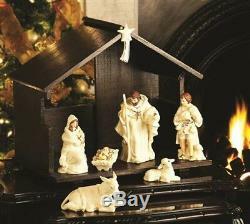 The item "Belleek China Classic Christmas Nativity Set With Stable and Star. New" is in sale since Thursday, October 12, 2017. This item is in the category "Pottery, Porcelain & Glass\Porcelain/China\Belleek". The seller is "gilmartinsonline" and is located in Enniskillen.